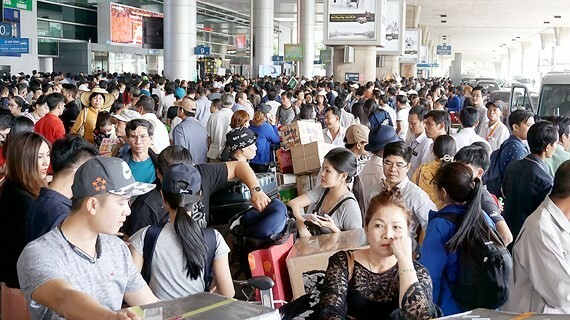 Tan Son Nhat International Airport has been crowded and even congested for the last few days partly because of the highly surging number of people coming to the airport to meet and see off their relatives. On February 7, the station of arrival of Tan Son Nhat Airport international terminal was filled with people who came to meet their relatives returning to Vietnam to celebrate Tet holidays. Tens of relatives were present to meet only few people from abroad. Vehicles have been increasing in some streets surrounding the airport such as Truong Son, Cong Hoa and Nguyen Van Troi. According to Tan Son Nhat International Airport, the number of passengers in domestic flights will approximate 134,000 a day in the next couple of days. Flight frequency will raise 10-15 percent over the same period in 2017. Passengers are estimated to top 4.1 million during the peak time of Tet travel season from January 30 to March 2. The number of landings and takeoffs will reach 26,300. During this phase, the airport will hike night flights to reduce pressure for daytime flights. A representative of national flag carrier Vietnam Airlines said that the number of international flights strongly increased for the last ten days, reaching 1,210 or 121 flights a day on average. The airport says that it is needed to limit the number of people arriving at the airport to pick up or see their relatives off to prevent congestion and disorder. According to the Department of Transport, Tet travel demand will soar 5-10 percent over the same period last year and 120-130 percent over normal. 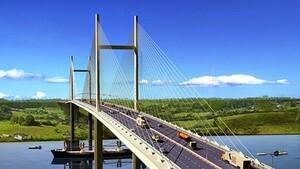 That will largely affect traffic conditions and residents’ travel.